A classy and jazzy DOMESTIC Granny Smith, dipped in buttery caramel, then dunked in our creamy milk, dark or white chocolate- decorated with a jazzy drizzle of contrasting chocolate! Done tastefully and carefully, and not over the top! Choose from milk, dark or real white chocolate covered caramel! On the Milk Chocolate and White Chocolate Apple, we drizzle Dark Chocolate. 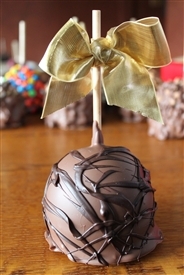 On the Dark Chocolate Apple we drizzle Milk Chocolate! Our apples weigh 14 ounces or more and have an American hardwood stick, just like olden times! Wrapped in cellophane and tied with a seasonal colored bow! Special requests always welcome- call us at 518-372-2243!